I can’t believe we pulled it off! Two weeks ago, I co-hosted my very first financial conference and it was an amazing success. I think it exceeded all of our expectations, including the hosts and the guests. I’ve never been to a conference that promoted getting outside and exercising and then matching that excitement with consistently incredible speakers who each added value in their own unique way. Now that we’ve had a chance to digest everything that happened, I sat down with our Chief Options Strategist, Sean McLaughlin, to discuss the event and some of the things that stood out the most. I hope you enjoy this quick rundown of our 2 day Technical Analysis Conference in Breckenridge, CO that we proudly call “Chart Summit”. On this podcast episode, we’re flipping the script a bit. I was invited to come on the DailyFX Podcast hosted by Tyler Yell last week, and I wanted to share that audio with you here today. 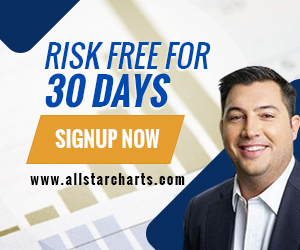 In this conversation, we discuss the recent Chart Summit in Breckenridge, CO, how and why I started Allstarcharts.com and what trends I’m currently seeing in the market. One thing we also talked about was the benefits of journaling and writing ideas down on paper. I really enjoyed this conversation so thank you Tyler Yell and DailyFX for inviting me on. Howard Lindzon has always been there for me. He is the founder of Stocktwits, who originally built Allstarcharts.com back in 2010 and welcomed me into their network of bloggers. Many of these are still around today and doing better than ever! Howard has invested in some of my ventures over the years and I’ve invested in a few of his. He keeps me posted on developments in the private markets and I keep him up to speed on public markets. Last week was the Chart Summit in Breckenridge, CO. You can watch my presentation here. On the second day of this awesome event, I sat down and had a fireside chat with Howard. We discuss what he likes to call “Chart Art”, and we also talk about some of the biggest trends he’s seeing in Finance and Technology. Although this was a Technical Analysis conference, I think getting to pick the brain of a master VC about the tools we’re using, or will be using, adds value to both the Chart Summit and Podcast. I hope you enjoy this one as much as I did! Jon Bloom is the Head of Institutional Sales for us here at All Star Charts. He brings over 20 years of experience as a sell side trader. We’re thrilled to have him as part of the team and I invited him on the podcast to share his thoughts on the way the business has changed since the 80s and 90s. The old model is broken and dying a slow and depressing death. We’re fortunate to be positioned to take advantage of these changes and I think we’ve done a good job of filling that void. Buy side clients are simply not getting the service they need because of the conflicts of interest on wall street, so they’ve been coming to us for help. As the Chief Strategist, I’m winning all day because I get to speak with some of the biggest and most powerful Portfolio Managers on earth, every day. I should be paying them! Jon Bloom does a good job of explaining why that old business is over and why he decided to join us at All Star Charts specifically last year. We’ve had a lot of different perspectives on the podcast, but this is the first time that we are really able to dive into the actual business. I really enjoyed this one so I hope you find as much value from it as I did. This past weekend I was down in San Diego for the annual Trade Ideas Summit. I gave a presentation earlier in the day, which you can watch here, and then sat on panel later in the afternoon with some really smart guys. So I thought it would add value to share this conversation with everyone. My good friend Sean McLaughlin, who is also the Chief Options Strategist at Allstarcharts.com moderated the panel, which included Brian Shannon and Dr. Brett Steenbarger. This conversation revolves a lot around process. Dr. Brett gave us a ton of insight as to what we can do psychologically to help us perform better. Brian is someone who I’ve been learning from since 2005, so it was a real treat to be sitting up there with these guys. This past weekend was the 5th annual Traders4ACause Conference in Las Vegas. It was a lot of fun and a bunch of us helped raise money for a list of great causes. On Saturday I gave a presentation about what I’m currently seeing in the markets, including Stocks, Bonds and Currencies. Sunday I sat on a panel with Joe Fahmy and Paul Singh and we just chatted about the markets, what we’re seeing out there and shared some stories about the things we’ve learned over the years. We recorded the conversation so here it is in full. I encourage everyone to check out the Traders4ACause site and donate even if you could not attend. I hope you enjoy our discussion!